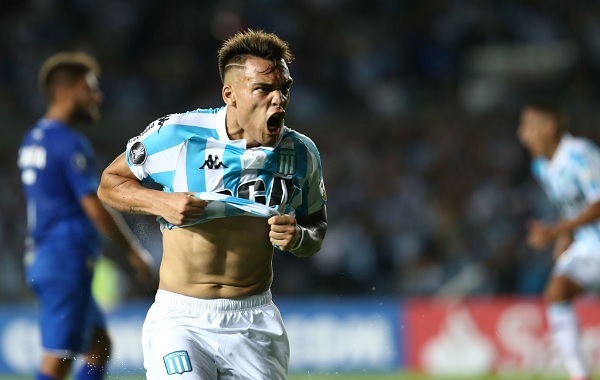 A Lautaro MARTINEZ hattrick for Racing Club sealed a 4-2 victory against Cruzeiro in the Copa Libertadores. Two goals in the first half and a thrid in the second gave Lautaro MARTINEZ his first Copa Libertadores hattrick in his first Copa Libertadores match. Not only one of the hottest prospects in Argentina but of South America, MARTINEZ’s value continues to grow and the week can get better for the Racing youngster. 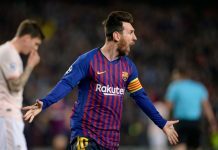 With Argentina National Team coach Jorge SAMPAOLI once more in attendance, MARTINEZ gave the coach three more reasons to call him up for Argentina on Thursday. 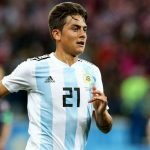 SAMPAOLI will announce his list on Thursday and with strong rumors that Paulo DYBALA of Juventus missing out, it could mean that MARTINEZ make it into the team. A beautiful touch after a lovely cross sent into the area in the 14th minute gave Racing the 1-0 lead. Cruzeiro drew level in the 30th minute with a header to make it 1-1 before they hit the post in the 32nd minute. Lautaro MARTINEZ gave Racing the lead right before the end of the half when the club from Avellaneda played a short free kick and MARTINEZ slotted the ball into the back of the net. In the second half, the Brazilian’s came close to drawing level hitting the crossbar. With 18 minutes on the clock in the second half, MARTINEZ completed his hattrick off a flying header to give Racing a 3-1 lead. Cruzeiro pulled one back off a fantastic free kick. Racing eventually made it 4-2 with SOLARI scoring the final goal of the match. MARTINEZ is the latest 20 year told to score a hattrick in the Copa Libertadores. The last 20 year old to do it? A certain NEYMAR in 2012 against Internacional. I’m all for giving Martinez a boost of confidence by calling him up but let’s see how he finishes the season before we declare him the next big thing. Right now I would have Icardi well ahead of him and if Kun proves his fitness till the end of the season then he should be a starter. Chucky is another option that I think should be seriously considered. If Martinez was Brazilian, he would be off to Barcelona as soon as I finish writing this comment. Barcelona seems to have some kind of financial ties with Brazil hence the reason they keep on buying young and old Brazilian players instead of going after some of Argentina more talented young players (and even seasonal players). This is why I can’t be a fan of Barcelona and never will, and to toss a Barcelona legend like Mascherano off to China in the middle of the 2017/18 club season while giving is number 14 jersey to Coutinho is a slap in the face at best. When Neymar left the club, Barcelona was without a prominent Brazilian player on their roster that’s why they desperately bought Paulinho (who is not even a Barcelona level player) from the Chinese Super League. Why was Barcelona so desperately to buy Coutinho in the January transfer window when he was already cup tied with Liverpool in the UCL? And it’s not like Barcelona needed Coutinho to win La Liga given how they already had a double digit lead over Real Madrid. Barcelona used shady financial deals to get Neymar and Paulinho to the club. Josep Maria Bartomeu try to deny this with the Paulinho transfer not too long ago. Since Alfredo Di Stéfano passed away, Real Madrid have since then cut all ties with Argentinean players on their main roster. 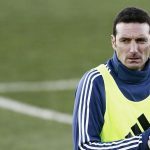 Francisco Feuillassier is the only Argentinean exception at Real Madrid, but he is more of a Castilla youth player and was only featured for the Real Madrid senior roster a couple times this season during the early rounds of the Copa Del Rey, and he only got last minute substitution appearances. Florentino Pérez, Ronaldo and Zidane are the main reason Argentinean don’t play for Real Madrid today. I even read an article saying how Zidane and Ronaldo was blocking Icardi move to Real Madrid. Benitez was trying to get Biglia to the club but Real Madrid blocked the move and instead sign Kovacic from Inter Milan. Zidane also block any move of Real Madrid signing Dybala earlier in the transfer window. I really want to see him in national team but also afraid it will be at the expense of icardi… Is there a chance aguero, icardi and martinez to be in squad? All the goals typical for Mertinez – seems very easy. I mean he is scoring so easy. Incredible instinct to be in right place in right time. He is one of those you may say about: the ball likes him. With this instinc he need not to imtprove or to be faster – he just needs to bring in the level on NT level. Don’t be surprised if he soon will be prefered over Aguero or Icardi by our coach. In Aguero more blatant case we know long time: scoring myriads in Premier League doesn’t mean he will score in NT. Very shy to score in national shirt. ..
To be faster? How? Btw he’s definitely faster than Kane or Luis Suarez (top-top stikers but both of them very slow yet score just for fun) and not slower than current Higuain, Lewandowski, Benzema, Benedetto or Icardi, yes Aguero and Aubameyang are faster. I am not so bullish for Dybala. The team for the next friendly games should be very closed to the final one. Usually the coach use them to finetune some details. It will be a waste to drop Dybala but no offence to his fans, the impact will not be huge as he will be just Messi’s backup and there is plenty of players who can do this and they play much more with their club than Dybala has done so far. To me, the critical thing is our fullback-wingers if we play 3-4-3. Only Acuna and Salvio know defending and there is no backup for them. Maybe Tagliafico for Acuna but nobody else on the right. I see Pavon, A.Correa or Rigoni more as Messi’s backup. Those are creative players but their defensive contribution is limited, same as Papu, Cervi, Perrotti, J.Correa and Di Maria on the left. Biglia: in any case, he will be in. His recent perf is good too. But I don’t know if it’s better to use him as CB or DM. Sampaoli used to convert his DM into CB, like what he did with Vidal in the past. Banega: the most creative one but also very irregular. He can give few assist but also miss his control in dangerous area within the same match. Lo Celso: he show some limitations as DM against big team with his club. Better in a deeplying playmaker role and need a real DM next to him. Kranevitter: good game against Russia but not much exp. As you can see, a true headache. Hope Sampaoli can find the good formula. Well Salvio is injured right now, so has to come back from injury and gets into form again before the world cup before we can consider him a sure thing under Sampaoli. As for the winger/wingback position don’t worry, assuming Sampa makes the mistake of going with a 3-4-3 formation there are several players who can fill in for Acuna and Salvio on the left and right respectively. Angel Correa can play on the left and right side of the midfield and I don’t know how much of Correa’s game you have seen recently but the kid defends very diligently. Franco Cervi is a great option on the left side because he played LM for Benfica in the past and did quite well and now is playing LF and is killing it (5 assists and 2 goals in the last 7 games). Rodrigo depaul is another good option as RM, infact he’s only dipped in form recently because he got moved to CAM when his best position was clearly on the right side of the midfield as RF, RAM or RM. Correa is the key to Argentina’s World Cup… his work rate is extraordinary on the right wing for atletico and his passing/crosses are underrated… he can start for Argentina in a 3-4-3 or 4-4-2 formation. Huge fan of Correa since some time, he takes Carrasco’s place who was one of the top players of AM, that proved already how important he is now. He deserves all this coz he came from very far due to his illness. I agree with you that there are lot of more talented and creative wingers over Salvio and Acuna. But none of them defending as well as him. That should be the only reason why they are chosen by Sampaoli initially. Is he someone else ??? YES HE IS A TALENT SHOULD BE GIVEN CHANCE BUT STILL NEED TO IMPROVE . IF HE CAN BENEFIT THE NATIONAL TEAM ,FINGERS CROSS! If Sampaoli takes 3 forwards to Russia, it will be Aguero and Icardi for the 1st 2 places. The 3nd one will be either him or Benedetto. To me, he is the most talented one even comparing to Aguero. I doubt Sampaoli waits for Benedetto. Even if he will recover before WC it’s still needs time to back to best form. Martinez is the man instead Benedetto.